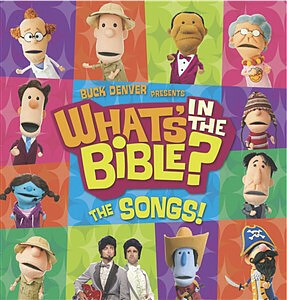 Buck Denver and Friends present What's In The Bible - The Songs! This CD has 18 tracks that children will love to sing over and over again. Full of energy and scripture this is a great CD to accompany the What's In The Bible DVD series. What's In The Bible - The Songs! Whats in the Bible? The Songs! is the first music product to come out of the 13-DVD series from VeggieTales creator Phil Vischer. In his first new project since VeggieTales, Vischer has set out to teach kids (and parents!) the story of the Bible  Gods great rescue plan! We know the stories of Moses, Noah, David, and Jesus, but in this groundbreaking new series, we learn how they all fit together to tell one big, redemptive story. Vischers signature wit shines through with his all-new cast of characters, fast-paced flash animation, and catchy tunes. This is one journey through the Bible you won't want to miss! The Songs! Features 18 of your favourite tunes from the first 5 DVDs. What's In The Bible - The Songs! by Phil Vischer was published by Kingsway in December 2011 and is our 6630th best seller. The ISBN for What's In The Bible - The Songs! is 853026002394. Buy Together Offer for What's In The Bible - The Songs! Reviews of What's In The Bible - The Songs! Be the first to review What's In The Bible - The Songs!! Got a question? No problem! Just click here to ask us about What's In The Bible - The Songs!. Now Playing: What's In the Bible Theme Song Your browser does not support the audio element. Details for What's In The Bible - The Songs!